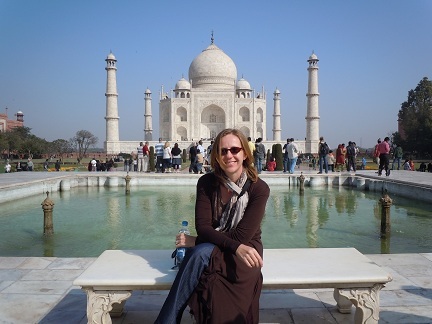 The Taj Mahal in Agra, India, is the culmination of a love story that has enthralled millions since it was built in the middle of the 17th century by Shah Jahan to house the remains of his beloved Mumtaz Mahal. Like all great love stories that have ever fuelled our notions of romantic love, this one is also wrapped in legend. It is said that Shah Jahan locked himself in his rooms and refused to eat for eight days after his great love passed away, and when he eventually emerged from his room, his once black beard was completely white. 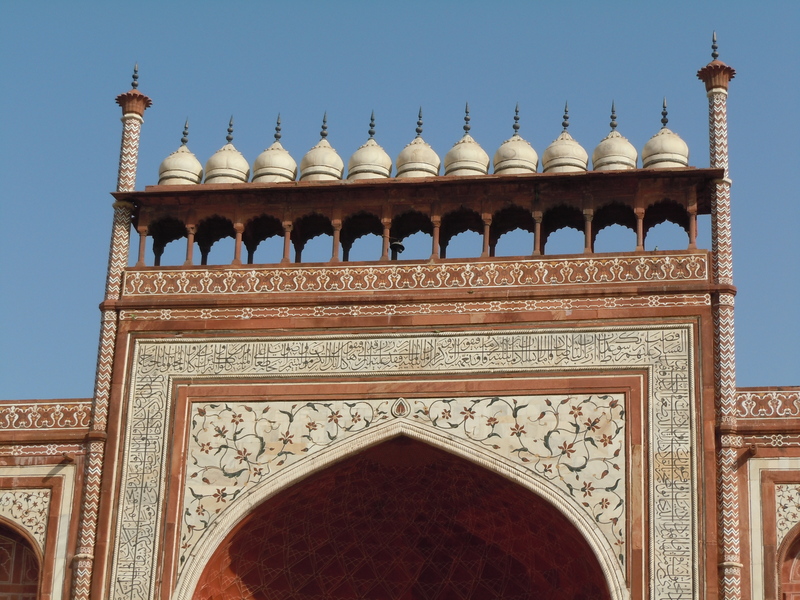 Soon after her death he started the ambitious building project that is a great deal more than just a mausoleum – it has become a symbol of love and is viewed by many as the pinnacle of Mughal architecture and artistic expression. The Makrana marble, used for the mausoleum, was mined close to the city of Jodhpur in Rajasthan, and stands in sharp contrast with the red sandstone of the secondary buildings. The white marble domes seem to float weightlessly in space, and, depending on which time of the day you visit, the hues of the marble seem to be in constant flux, adding to the other-worldly beauty of the complex. There is another love story that played itself out against the backdrop of this monument: one in which Rudyard Kipling’s words ring true when he described the Taj Mahal as “. . . the embodiment of all things pure, all things holy, and all things unhappy”. In 1992, Diana, Princess of Wales, visited the Taj Mahal without her prince, who was attending a function in Delhi. With their marriage on the verge of collapse, Diana’s solitary visit to this famous monument to love, served as a poignant moment of irony. The Daily Express in England splashed the headline “Temple of Loneliness” across its pages with the now famous photographs of the people’s princess sitting all alone on a bench. As is the case when important dignitaries visit the Taj, it was closed to the public on that day, and the absence of laughing voices must have served to emphasise the desolation and melancholy Diana must have experienced in that moment. It was only when my guide was adamant in taking a picture of me on this, now famous, bench that I was reminded of this love story again. Diana’s bench has become another way of selling their great monument to the tourists thronging through the grounds each year. I had to wait a while before I could have my moment on the bench, and although it was not on my must-do list, it seemed to immensely please my guide, so I indulged him. Much later I realised that my picture was taken, not on the actual bench Diana sat on, but the one opposite from it. I guess no one really cares as, in all the tales we weave around great love stories the truth is often adjusted for added effect. My visit fell on a Sunday, and I shared the space not only with tourists from all over the world, but many Indian families that came to pay homage to one of their great monuments. Despite the busy-ness of the place, there was a tranquillity that permeated the air. The gentle trickle of water and calls of green parrots gathering in the tall trees served as auditory reminders of beauty and life. Everywhere people struck the obligatory poses: “Taj in your palm” or “Taj dangling from your fingertips”. The three small Japanese women in colourful saris, looking as pretty as the pietre dura inlay work that brightens the interior that surrounds the tombs, when scuttling past us, struck a strange cultural image. Following them, we entered this inner sanctum, and were reminded that photography is not allowed. A guard with an ear-piercing whistle tried his best to keep the swirling stream of visitors in check, and every time a trigger of flashes, brighter than the sparklers on a birthday cake, went off, short bursts of anger were whistled at the offenders. There is anonymity in the masses and the culprits were well protected from the wrath of the guard. Any stragglers were encouraged to “keep moving”, but before the pushing and shoving could become an ordeal, I once more felt the bright sunlight on my face. The brief glimpses I got through the pierced marble screens that surround the cenotaphs revealed one big and one small one. 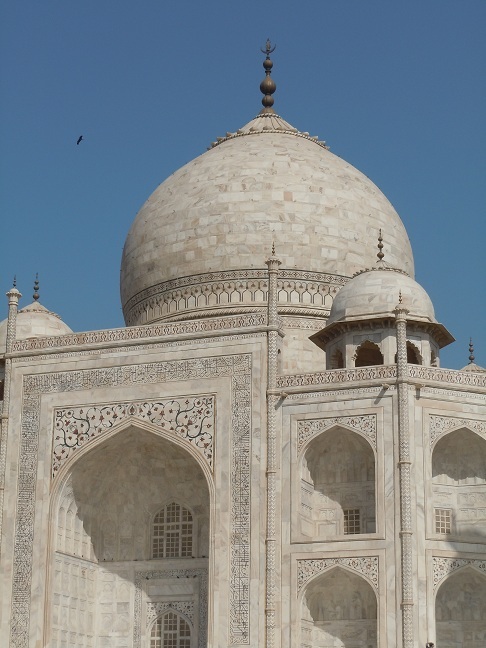 The small one for Mumtaz Mahal is in the exact centre of the building, while the bigger one for Shah Jahan is slightly off-centre, and the only thing that breaks the perfect symmetry that rules the whole complex, as it was an addition that was never planned for while building the Taj. The actual tombs of the two lovers, united in death, lie directly below the cenotaphs in a crypt that is not open to the public. It is only on a Friday that an awkward silence descends upon the Taj Mahal. It is a day that is designated for cleaning, while Muslim worshippers attend the mosque for Friday prayers. Great care is taken to preserve this architectural Ode to Love, on the banks of the Yamuna River that silently plays witness to the passing of the seasons. Perhaps one can on those magical full moon nights, when the Taj opens its doors briefly for a night visit, imagine a time long, long ago when the mighty Mughals ruled this part of India.